Is this a paperless industry? Do you correspond by telephone alone? Do we really need pieces of paper floating around? In this Infomail we will be looking at the virtues of DJ paperwork. Whether you call it a contract, a booking form, a confirmation to supply services or something else, having a written agreement is essential to the smooth running of your mobile DJ business. 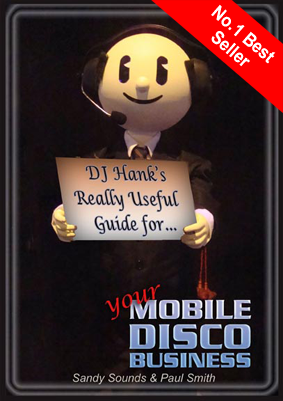 The 6th in the series of "The Trials & Tribulations of a Mobile DJ" - a light hearted look at the mobile DJ in the 21st century is now released. Tickets for BPM 2011; the World's largest event for DJs are now on sale. Following a tremendously successful show in 2010, which attracted just over 6000 visitors, BPM 2011 will return to the Birmingham NEC later this year from Saturday 1st to Monday 3rd October. Advanced ticket prices for BPM have been held at £10.00 and guarantee entry to every day of the event and also represent a substantial saving from the £15.00 on-the-door price. Ticket sales will once again be handled by the NEC's dedicated ticket outlet, The Ticket Factory, online or over the phone, and there is a 50p transaction fee per order. This Complete Package All inclusive for only £49! "If your business is a ship then the paperwork is the engine room"